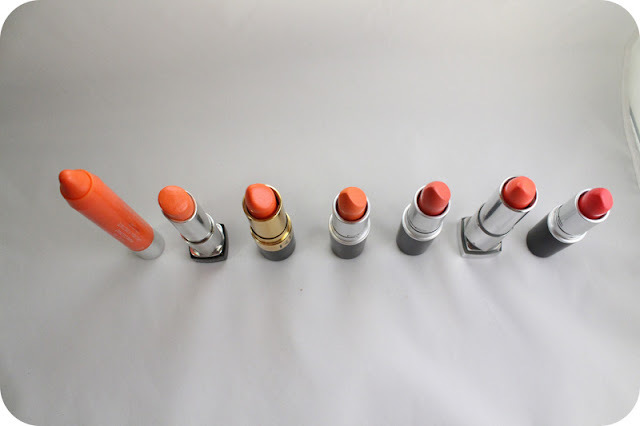 It's spring time which means it is time to break out the orange lips! This season orange and coral will be very popular again, as it usually is. It's also my favorite lipstick color when it comes to brights (vampy purples are my second favorite). Orange just brightens up the face, it looks fun but not intimidating (I reserve reds for that). 1. Revlon Just Bitten Kissable Balm Stain in “Rendezvous” - This is a chubby lip pencil that’s supposed to be a dupe for Clinique’s and Tarte’s pencils but since I have not tried those I can neither confirm or deny that. 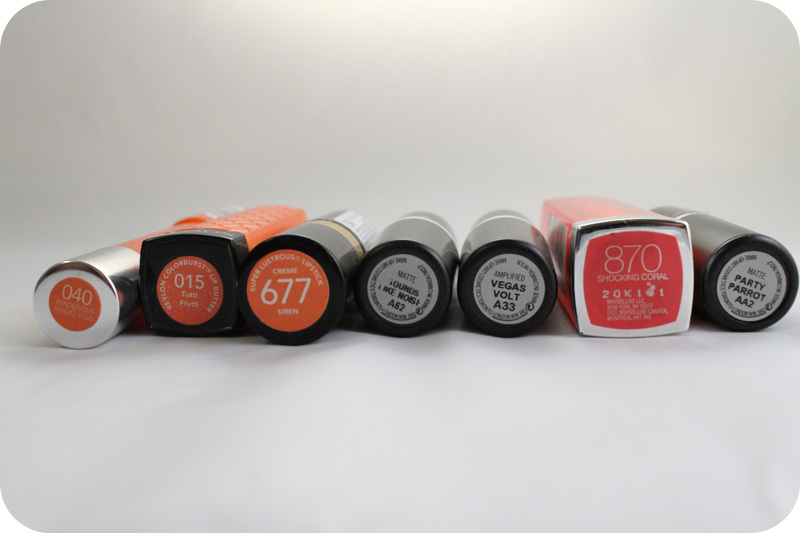 It is a true orange with a little bit of sheerness that allows your natural lip color to transform the shade. So if you have pigmented lips, this might not look as orange as you want it to be (you can always put a little concealer/foundation on your lips to tone them down if you don’t have sensitive lips like me). It’s also super glossy and shiny that lasts about 2-3 hours. Once that’s gone you probably have about another hour or two of color left depending on factors like talking and drinking. The stain isn’t as powerful on this shade as the darker ones in the line, but it’s enough to leave that popsicle color behind. 2. Revlon Lip Butter in “Tutti Frutti” - Oh the Lip Butter. I’m pretty sure someone out there on YouTube has probably written a song about this lip product. If it does not exist, can I request Vanessa to do one? (kidding! but not really). Since this is supposed to be more of a tinted lip balm it is actually a bit more sheer than Rendezvous. The color is definitely orange, with a little more pink in it but not a coral yet. The wear on Lip Butters is pretty terrible on me, 2 hours max. I wore this pretty much all summer last year and it’s my 2nd most used up Lip Butter. It’s a little sticky in the beginning, but that wears out along with the glossiness. I highly recommend this if you are scared of oranges but want to try it. 3. Revlon Super Lustrous Lipstick in “Siren” - My 3rd Revlon orange shade (and my last) is Siren. The Super Lustrous line is a pretty good solid lipstick from the drugstore so again, if you are just starting to dabble in these colors, or in lipstick in general, try these as they come in 82 (!) colors, all kinds of different finishes, and are pretty affordable (especially at Target). Siren is a creme finish meaning just that: it’s creamy, shiny, and opaque, but not glossy or 100% matte, it’s a nice middle ground. I haven’t worn this too much as I acquire it right before my lips went to hell, but it’s a pretty great color. It alone looks like a true orange, but when compared to the other colors I have (especially the next one) it leans a little more red. 4. MAC Lipstick in “Sounds Like Noise” LE: This came out in April in conjunction with Paramore’s newest album. This lipstick was 1 out of 4 items that Hayley Williams, lead singer of Paramore, put out with MAC. SLN is a damn true matte orange lipstick. It’s opaque but like many MAC mattes, it’s hella drying. The finish shows a lot of imperfections in the lips so exfoliate before using, and probably lay down a lip balm like EOS (that’s not too slippery) first. This wears a solid 5 hours for me, and can probably pull off a 6th without reapplying lipstick, just a little balm/gloss. This is Limited Edition and still available on the MAC website, but don’t know for how long, so hurry! If you miss out, there’s always Morange from MAC. Now, does a person need ALL 4 of these lipsticks? No, not really, but the fun part is in the slight differences, from finish to wear time. Also, how freaking bright is Sounds Like Noise compared to the rest? 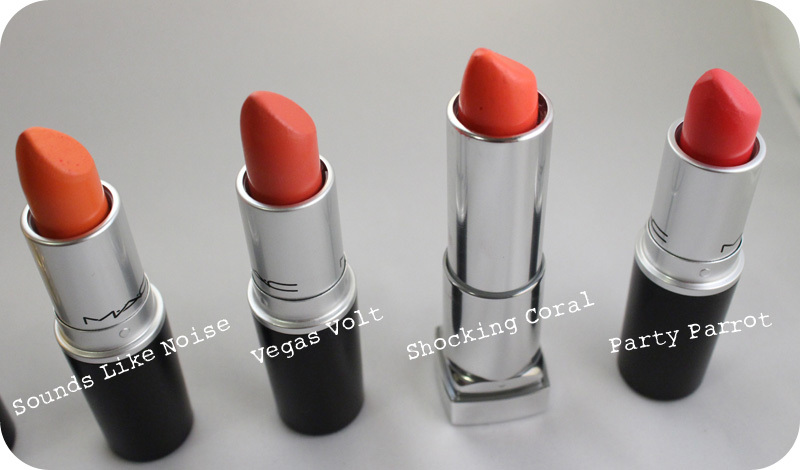 I have three coral lipsticks, 2 from MAC and 1 from Maybelline. Ignore the far left one (SLN), that belongs in the oranges above. 5. MAC Lipstick in "Vegas Volt" - This is my latest addition, a birthday present from my sister. It's a pretty perfect color as it still has orange, but the pink in it tones it down for a more "wearable" color that is less bam! It's an Amplified finish so it's still creamy while having great pigmentation. I can't really comment on the wear time because I've only worn it once, and it was to a dinner. When my lips get better, this is going to definitely something I wear a lot.6. 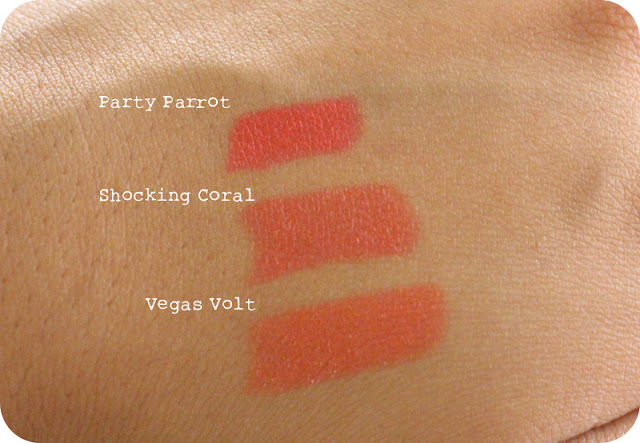 Maybelline Color Sensational Vivids in "Shocking Coral" - If spending more than $10 on a lipstick just doesn't feel right but you are still craving the bold colors from high end, definitely check out this Maybelline line. It's permanent! I got this one day while out shopping with Vanessa, I was really craving a bright coral (I didn't have Party Parrot yet). It's so hard to describe the color as it's definitely not orange anymore, but not quite pink. This wears great, though a little drying. I also really don't like the plastic like scent, very lipstick smelling. And to once again bring up my lips, I'm pretty sure I had a slight reaction to this lipstick; my lips got itchy and really flaky. But if you have tough lips, this is a good place to start for bright lips. 7. MAC Lipstick in "Party Parrot" LE - Another product that deserves a song, maybe Rachel at 87daysbefore will write this one. Amazing color, definitely right on the border between coral and pink, like millimeters away. I think what keeps it in the coral family is the warm undertones, as opposed to blue/cool ones which would make it more of a magenta. This, unfortunately, is also Limited Edition and not currently available. But if it's ever repromoted, jump on it! It's a matte but not as drying or unflattering as Sounds Like Noise, Party Parrot is one of MAC's better mattes. 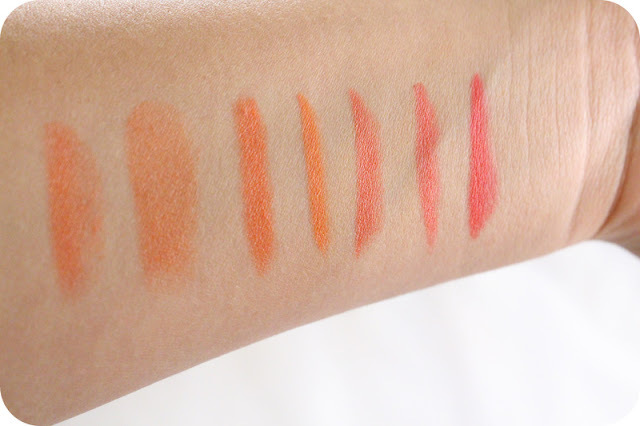 And there you have it, seven great lipsticks to fulfill your orange craving. Any suggestions for colors I should add to my collection? Please let me know! I am looking for a coral that looks similar to Mac's Sounds Like Noise but since I've never tried coral or an orange (always wanted to but my lips are too huge)but don't really want to commit or invest much money, I'd like something cheaper. I love a matte finish and NO gloss. Do you think Revlon has something like that? Wet N Wild is where you want to go. they have these matte lipsticks, megalast line, for $1.99 in amazinggg colors. they have two oranges: 24 carrot gold and purty persimmon. Those are probably going to be the closest to something like Sounds Like Noise. In other news, they also have one called Sugarplum Fairy that's a dupe for MAC's Rebel, if you are interested in something purpley.